These unidentified cyanobacteria were collected in the Pacific Ocean near Hawaii. Photo by Rachel Foster. Scientists on the research vessel Kilo Moana collect samples in the South Pacific Ocean to search for nitrogen-fixing microorganisms. Photo by J. P. Zehr. An unusual microorganism discovered in the open ocean may force scientists to rethink their understanding of how carbon and nitrogen cycle through ocean ecosystems. A research team led by Jonathan Zehr, professor of ocean sciences at the University of California, Santa Cruz, characterized the new microbe by analyzing its genetic material, even though researchers have not been able to grow it in the laboratory. Zehr said the newly described organism seems to be an atypical member of the cyanobacteria, a group of photosynthetic bacteria formerly known as blue-green algae. Unlike all other known free-living cyanobacteria, this one lacks some of the genes needed to carry out photosynthesis, the process by which plants use light energy to make sugars out of carbon dioxide and water. The mysterious microbe can do something very important, though: It provides natural fertilizer to the oceans by "fixing" nitrogen from the atmosphere into a form useable by other organisms. A paper describing the new findings appears in the November 14 issue of the journal Science. Earlier research by Zehr's group had revealed surprisingly large numbers of novel nitrogen-fixing cyanobacteria, including the one that is the focus of this study, in the open ocean. Although 80 percent of Earth's atmosphere is nitrogen, most organisms cannot use it unless it is "fixed" in combination with other elements to make compounds like ammonia and nitrate. Because nitrogen is essential for all forms of life, nitrogen fixation is a major factor controlling overall biological productivity in the oceans. The new microbe is one of the most abundant nitrogen fixers in many parts of the ocean, Zehr said. New DNA sequencing technology provided by 454 Life Sciences enabled rapid sequencing of the organism's genome. The results showed that it is missing the entire set of genes needed for photosystem II and carbon fixation, essential parts of the molecular machinery that carries out photosynthesis in plants and cyanobacteria. 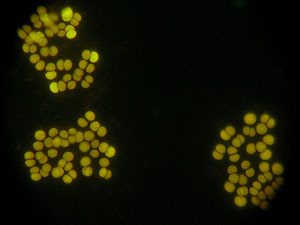 Zehr's team was able to obtain a mostly pure sample of these unique cyanobacteria using a flow cytometer--a device that rapidly sorts individual cells based on size and color. The flow cytometer can take the cell soup from an ocean sample, classify each cell as it passes through laser beams, and sort different cell types into separate containers. A cell type that makes up a small percentage of the original sample can be concentrated to nearly pure levels using flow cytometry. The team harvested DNA from the concentrated sample of cyanobacteria and sequenced it using the Genome Sequencer FLX system from 454 Life Sciences. The company's new sequencing reagents and software produce extra-long "reads" of DNA, greatly increasing the speed of the sequencing process. "We were able to gain early access to this new high-throughput technology for rapid sequencing of the microbe's genome," Zehr said. "I had begun to suspect that there was something missing in this organism's genome, and the genome sequencing confirmed that." Photosystem II is a large complex of multiple proteins and chlorophyll molecules, but the team was unable to find any of the genes for the photosystem II core proteins. The genes for photosystem I appeared in the sequencing data, as did genes for both photosystems from the small numbers of contaminating cyanobacteria in the sample. Zehr said he plans to continue his research on the new microbe and fill some gaps in the present knowledge. 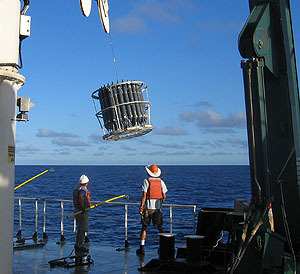 Efforts are currently under way to map the microbe's presence in the oceans and determine its global abundance. Zehr is also interested in how its metabolism differs from other known cyanobacteria. If it can be cultured, there may be ways to exploit this organism's unusual metabolism in biotechnology applications, he said. Zehr's coauthors on the paper include graduate student Shelley Bench, researcher Brandon Carter, and postdoctoral scholars Ian Hewson, Tuo Shi, and James Tripp of UCSC, as well as Faheem Niazi and Jason P. Affourtit of 454 Life Sciences. This work was supported by the Gordon and Betty Moore Foundation, the National Science Foundation (NSF), and the NSF Center for Microbial Oceanography Research and Education, and sequencing was provided by 454 Life Sciences.